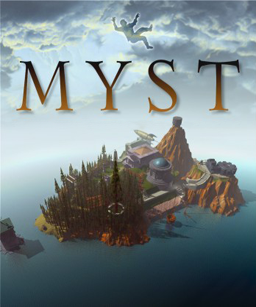 Myst is a first person adventure game by Cyan (now known as Cyan Worlds). In the game, you are a person who is brought into the book of Myst and must explore the book's world and solve puzzles to discover the secrets within. It was released originally on Macintosh on September 24, 1993, and has been remade and ported to many different systems over the years. The latest ports to the game in North America are for the Nintendo DS on May 13, 2008, on iPhone/iPod Touch and iPod on April 22, 2009, on PlayStation Portable on July 16, 2009, and on the Nintendo 3DS on cartridge on October 26, 2012 and by download through the Nintendo eShop on November 15, 2012.